Helen of Troy, according to Greek legend, was the most beautiful woman in the world, and her loveliness sparked the Trojan war when she was abducted by Paris, son of Priam. We hope that our Helen handmade encaustic cement floor tile isn’t going to start a war, however with its clean bright design of a warm red on a white background, it’s unparalleled beauty might well cause a commotion. Anatolia is the western-most part of Asia and forms most of modern-day Turkey. 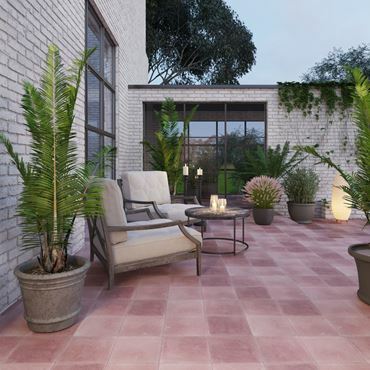 It is a place steeped in history and tradition, and you can bring a little of that exotic mix of cultures into your home with these subtle handmade encaustic cement floor tiles. The name comes from the Greek meaning East, and our Anatolian Gold encaustic tiles reflect the magical beauty of the east with their intricate bi-colour design. Beyoglu is a neighbourhood of Istanbul, Turkey, with a rich history of different cultures and exquisite architecture, and it currently houses many museums and art galleries. Bring a taste of that exotic mix of cultures into your home with these wonderful traditional-style handmade encaustic cement floor tiles. The four subtle, natural colours of the large design of these hand-crafted cement tiles make them ideal for use in a larger space. Each one of these striking handmade encaustic cement floor tiles bears a large stylised leaf shape in a warm shade of yellow against an off-white background. Lay them to form a large impressive yellow flower to make an impact over large expanses of floor or wall. These lovingly crafted cement tiles are made using natural pigments to give gentle, yet profound colours which will keep looking great for many years to come. You’ll never call it curtains on these handmade encaustic cement floor tiles. With their long-lasting 8-mm deep colour layers, their strong hand-made construction, and their delightful design, your pleasure from these encaustic tiles will never have to come to an end. Enjoy this charming design of cool celestial blue circles interspersed with warm four-pointed yellow stars, highlighted in black across your floors or on a wall of your home or business. Raindrops aren’t falling on my head, they are adorning the floor beneath my feet. The large, softly- coloured stylised raindrops of these encaustic tiles are separated by black to create a stunning visual effect. Their warm colours will never fade and each of these handmade encaustic cement tiles is hand-made with the greatest of care using the finest materials to bring you pleasure for many years. The bright white background of these handmade encaustic cement tiles makes the crisp patterns in deep black and warm yellow really stand out. They have a clean, refreshing feel, ideal for the heat in a Californian desert, or to brighten and enliven a floor or wall in any home. These decorative cement tiles will look great with many different colours of furnishings and décor. These charming handmade encaustic cement tiles look like a present wrapped up with a ribbon and complete with bow. You will certainly feel you have received a wonderful present, because these handcrafted decorative tiles can transform any space into somewhere very special. These encaustic tiles have a gentle blend of two rich shades of blue, with mottled grey and white and will complement many furnishing colours.